.View free 2900 photographs of all existing 147 GWR locos. .View 2900 images of all 147 preserved GWR locomotives. .Peter Pascoe's photos of every surviving GWR steam engine. .90 GWR steam engines photo'd in 2019 now included. Probably the most comprehensive display of photos of all existing GWR locomotives available, this website includes 2900 images of all 147 existing GWR standard gauge locomotives. Basic information on each locomotive is included. Three GWR Diesel Railcars & Steam Railmotor 93 are also included. Most photographs have been taken from 2008 to date, but for some locomotives images include photos taken in Barry Scrapyard & other locations from 1965 to the mid-1980s. The aim is to photo as many as possible each year so as to show the latest state of any particular locomotive. Please also note that several locations will not necessarily be accurate because locomotives are often temporarily found elsewhere for repair, overhaul, restoration, main-line use or on hire to other Preserved Railways. It is advisable to check the location of a locomotive before travelling to see it. For the time being, Nos 2861 & 4115 will continue to be listed (but are not included in the 147 total in Para 1 above): 2861 & 4115 no longer exist with parts donated to 'new build' locomotives. 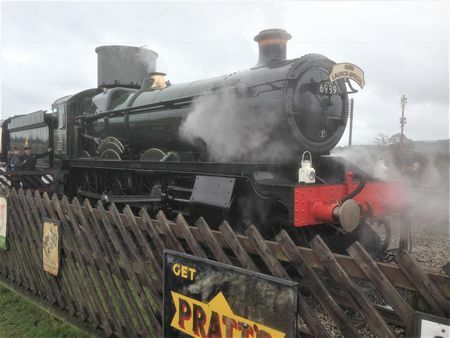 No 5227 has also 'lost' some parts, but is on display at Didcot as an ex-Barry locomotive. Please see various photographs of these 3 locos on the website. Select List of Locos to view the complete list of locomotives. Click on 'More' to display an enlarged photograph of that locomotive. Then scroll down to view more images of that locomotive - from 10 to 40 images of many locomotives in many locations are included. Additional photographs are being added regularly. Alternatively, use the 'Search' option on the Menu to locate any particular locomotive.